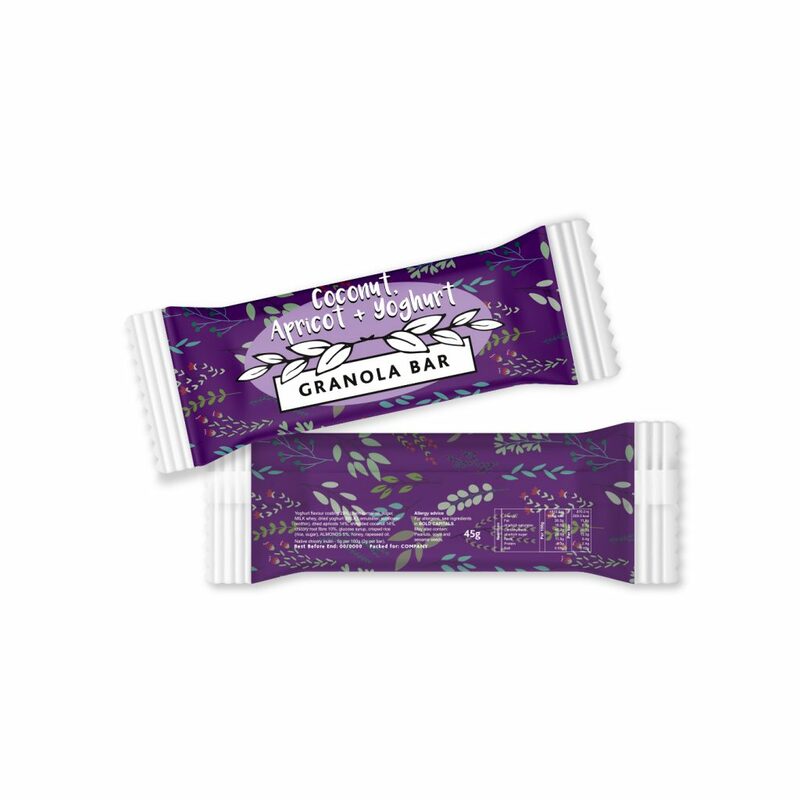 A flow wrapped Coconut, Apricot and Yoghurt granola bar. Branded with a full colour digital print to the film. Yoghurt flavour coating 29% (palm kernel oil, sugar, MILK whey, dried yoghurt (MILK), emulsifier: sunflower lecithin), dried apricots 14%, shredded coconut 14%, chicory root fibre 10%, glucose syrup, crisped rice, (rice, sugar), ALMONDS 5%, honey, rapeseed oil. Nutritional Information, typical value per 100g: Energy 1933kj/464kcal, Fat 26.5g, of which saturates 18.5g, Carbohydrate 45.2g, oh which sugars 29.5g, Fibre 11.9g, Protein 5.3g, Salt 0.05g. Allergy Advice: see ingredients in BOLD. May also contain: PEANUTS, SOYA and SESAME SEEDS. Store in a cool, dry place.